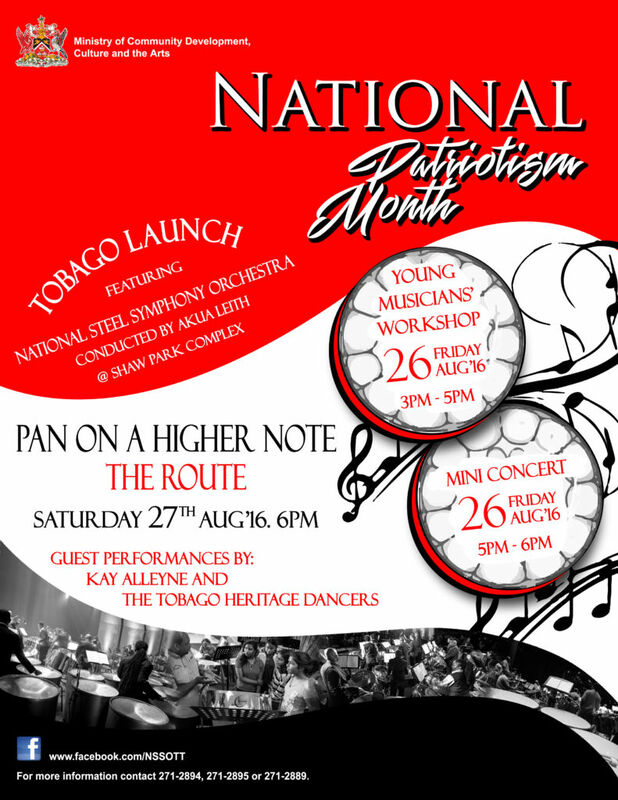 The Ministry of Community Development, Culture and the Arts launches National Patriotism Month in Tobago this weekend with the National Steel Symphony Orchestra (NSSO). National Steel Symphony Orchestra presents Pan on a Higher Note – The Route on August 27th, 2016 at the Shaw Park Complex from 6pm. Guest performances by Kay Alleyne and the Tobago Heritage Dancers. Admission is FREE. On August 26th, 2016 the NSSO will conduct a Young Musicians’ Workshop from 3pm to 5pm followed by a mini concert from 5pm. To register for the workshop call 271-2895.